With the start of the new school year just around the corner, your senior is about to begin a new chapter in his or her life. Use this critical time to ensure that your teen is ready to handle whatever awaits by helping him or her get organized and get a leg up on college before ever setting foot on campus. If your teen is undecided about a major course of study in college, now is a great time to think about what he or she might like to pursue. Your teen can explore possibilities through an interest or career assessment test. Ask the career counselor at your child’s high school if they have a recommended assessment or if they offer an in house assessment for their students. If your teen has some potential interests for a major, encourage him or her to contact different academic departments at local colleges to learn about options before college applications are due. He or she might be able to speak to professors or graduate teaching assistants. If you live near a campus, your teen may be able to sit in on a class or two. If your senior has already decided on a major course of study for college, encourage him or her to research all options available within the department. He or she may be able to organize a work-study position for next summer, or possibly join in clubs or groups within the discipline. Encourage your teen to get involved in his or her field of interest this school year by volunteering in the industry. Many times students can intern with local companies, which can provide invaluable insights into what a career will actually be like. So, if your teen thinks he or she wants to become a lawyer, perhaps an internship as a runner for a local law firm would be beneficial. If he or she is interested in computers, why not explore opportunities with the IT department of a local business? Make use of a planner. Be sure to include a good planner or calendar on your back to school shopping list. If using a planner is not a habit your student picked up thus far in high school, encourage him or her to start doing so now. Use this time to practice organizational skills – have your teen write all upcoming obligations, important dates and scheduled work or volunteer days in his or her planner. This fall presents your 12th grade student with the opportunity to take the SAT or ACT test, perhaps for the first time, or to improve a score they have already obtained. A higher SAT or ACT score can open doors to more colleges and universities, and give you and your child more options, both financially and academically. Prepare by enrolling your child in a prep course or 1 to1 study. This will give your senior the advantage of confidence and skills to perform on critical tests for college admissions. Founded in 1977, Huntington is a pioneer and leader in the tutoring industry. For over 35 years, Huntington has provided quality instruction to hundreds of thousands of students. 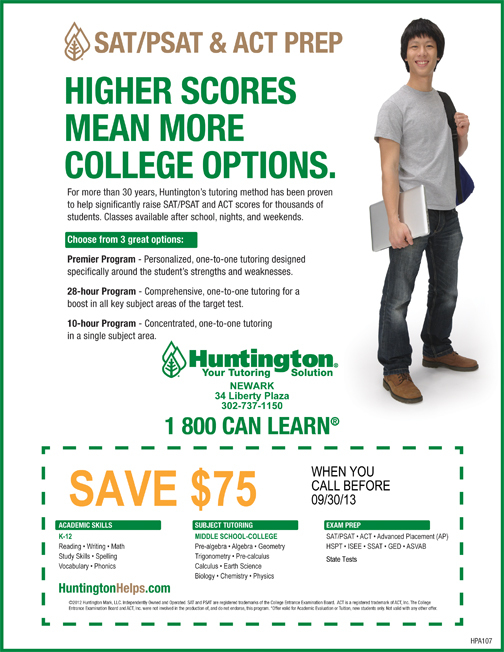 Huntington prides itself on being “Your Tutoring Solution” for students in all grades and subjects. They tutor in academic skills, such as reading, phonics, math and study skills; and in advanced math and science subjects ranging from algebra through calculus and general science through physics. They also prepare students for state and standardized entrance exams, such as high school entrance exams and the SAT and ACT and provide free school tutoring to eligible schools. 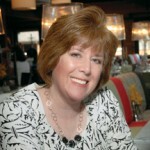 Maggie Lage is the Executive Director of the Huntington Learning Center in Newark, 34 Liberty Plaza, Kirkwood Hwy. Newark, DE 19711. I just wanted to thank you, the staff, and the wonderful tutors at Huntington Learning Center for the SAT and ACT test preparation for Taylor and Whitney. We were truly surprised and pleased that both girls got a 200+ point boost to their scores. Each daughter started in a different spot, had different goals and tutoring time, but had similar, excellent results. While the format of your program is very structured, I especially appreciate the customization to each child. I also want to thank you for being an extremely helpful college testing and application consultant. We would (and have) highly recommended the program for other families that needed flexibility and high quality tutoring. Thank you again, and we’ll be back again with daughter #3 in a few years.